Monster Mass is the perfect strain for both outdoor and indoor cultivation due to its explosively fast flowering and hardiness. 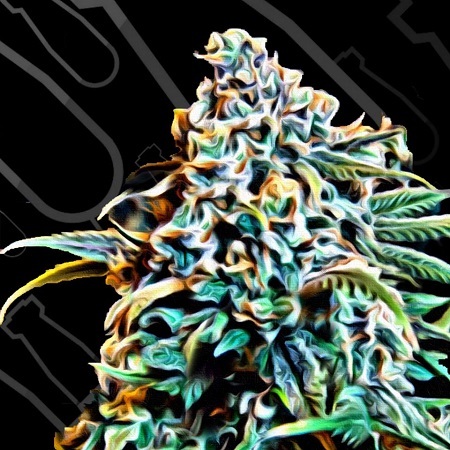 Monster Mass Feminized Marijuana Seeds by Critical Mass Collective Seeds: Monster Mass is the perfect strain for both outdoor and indoor cultivation due to its explosively fast flowering and hardiness. Outdoor is recommended as it grows much taller and with more branching. Critical Lee recommends the practice of FIMing the plant at an early stage when growing, indoor when it's showing 3 to 5 nodes this will stimulate lower growth whilst producing up to 4 colas rather than one main one boosting production. Introduce numerous plants to an SOG setup applying gentle LST for maximum results. Using this method on this strain will ensure that its branches will probably snap under the weight of its dense frosty bud so supports will be necessary. Outdoors LST is not necessary as natural climatic conditions will bend and super crop the plants for you. It is not overly affected by fungi or mold due to its ferociously fast flowering period which, indoor is around 45 to 50 days. If cultivating indoor, good ventilation and sensible humidity levels should be maintained throughout the grow. Outdoor it should be ready mid-end September. Monster Mass is the strain that started the groups insatiable thirst to grow the best mass hybrid the world has ever seen.